If the earth must perish, then astronomy is our only consolation. It sounds like a Hawking-esque call to colonize the galaxy, until you remember that Joubert wrote this in 1784. Astronomy here stands for the knowledge of (supposedly) eternal principles. A twenty-first century nihilist will ask what good any knowledge doomed to extinction can be. And yet we naturally prefer that each comet, each supernova, each exotic body orbiting an alien sun, at least fall under the passing gaze of someone. Possessed by one, the knowledge of a thing belongs to all. It becomes one step more in the project of humanizing the cosmos. Knowledge for its own sake sometimes gets a bad rap (trivia needn’t be trivial), but in a world under death sentence the thirst for knowledge is always at bottom a thirst for immortality. He would like to have words eat out of his hands. Due to the heavy editing of my copy of Renard’s Journal, I don’t have the context, but it’s a terrific image. The trouble with words is that they aren’t at all tame, but dangerous, and a bite may lead to infection. Hers was the unobjective and therefore limitless and insane desire of the moth for the star, of the schoolgirl for the crooner, of the bored and frustrated housewife for Rudolph Valentino. 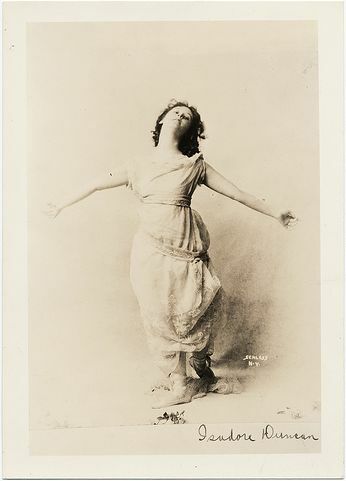 It’s not the woman Huxley had in mind, but the photograph is of American dancer Isadora Duncan, 1904. Nothing in the world delights a truly religious people so much as consigning them to eternal damnation. Justified Sinner is a strange book. Written in 1824 by an autodidact and former illiterate shepherd from the Scottish borders, it is nonetheless as postmodern as you like, with multiple competing narratives, Borgesian puzzles of perspective, and the author himself, James Hogg, appearing as a minor character under his own name in a later chapter. The story concerns the products of a failed marriage: two sons, one raised by the moderate father, the other by the fanatically devout mother and her spiritual mentor, a Presbyterian clergyman of the austere, controversialist school. The collision of these two is the fulcrum of the plot, which, despite comic interludes, grinds mercilessly away at the question of how far an unconditional assurance of salvation (without regard for one’s actions) serves as sanction to sin when one sins in God’s own cause. Justified Sinner is essentially an indictment of zealotry, an examination of what happens when one takes up the thread of strict Calvinism and stretches it to the precipice. When my forebears left Scotland and made a first appearance on this continent (ca. 1720) they were Presbyterians, according to family lore and church records. That they were not Presbyterians of a very strict variety I gather from the fact that my 5x-great-grandfather (b.1757) was apparently named after John Wesley. But one way or another, Calvinism passed out of our lineage long ago. My only personal encounter with Scottish Presbyterianism happened in, of all places, Paris. It was 1992 and I was a college student flitting about Europe for ten weeks. Out of ancestral curiosity I stepped one Sunday into a little church on a back lane near the Champs Elysées, called The Scots Kirk. An elderly clergyman was haranguing the assembled worshipers (mostly expat Scots) with a gale-force storm of hellfire peppered with sharp accusations against their moral consciences that anyone else might have taken offense at. Jolted as I was, those in the pews stoically received all this abuse without the least sign of either contrition or irritation. After the service I joined them for coffee hour and was enthusiastically received on account of my Scottish last name (not the name I use here). To complete my disorientation, the black-robed minister who was so violently consigning us to eternal damnation just moments before greeted me with the meekest, most unassuming smile, and the warmest handshake of all. Pellerin used to read every available book on aesthetics in the hope of discovering the true theory of Beauty, for he was convinced that once he had found it he would be able to paint masterpieces. He surrounded himself with every conceivable accessory – drawings, plaster casts, models, engravings – hunted around fretfully, blaming the weather, his nerves or his studio, going out into the street to seek inspiration, thrilling with joy when he had found it, but then abandoning the work he had begun, to dream of another which would be even finer. Tortured by a longing for fame, wasting his days in argument, believing in countless ridiculous ideas, in systems, in critics, in the importance of the codification or the reform of art, he had reached the age of fifty without producing anything but sketches. A study in poseurism. I used to be one of those young fellows who grow a beard and go unwashed, who buy an old electric typewriter and the full oeuvres of Kerouac, Brautigan, and Camus, and try to get into the habit of smoking cigarettes and drinking vodka at midday in order take themselves more seriously. But life in one’s thirties has its mercies. Pre-adolescence did too: At ten years old I walked every Thursday to my art teacher’s home after school carrying a tackle box full of pencils and brushes without the least thought for what these things said about me. God save us from artistic accessories. [E]very individual man has an inner life, and is aware of the practical impossibility of understanding others or being understood – in general, of the star-like isolation in which human beings live. Nearly all literature is an attempt to escape from this isolation by roundabout means, the direct means (words in their primary meaning) being almost useless… “Imaginative” writing is as it were a flank-attack upon positions that are impregnable from the front… The art of writing is in fact largely the perversion of language. Only art, according to Orwell, manages to bridge the chasms between persons and effectively deliver the inner reality of one to another. Music is an obvious example, and Orwell has some nice things to say about film. But the art of writing – poetry, the novel, etc. – is paradoxical: it can only achieve its goal by stretching and calculatedly misusing language in such a way as to force upon words a labor for which they are basically unfit. I once stumbled on the helpful suggestion (it might have been in Barfield’s Poetic Diction) that a poem, any poem, is best understood when read as if it were a word unto itself, a single word made up of specific component words in a specific order – unutterable any other way. The same might be said of a novel or a story. Successful literature makes new words out of the bones of old words. It manages by calculated accumulation and oblique methods (cadence, music, association and dissociation), to communicate something of the inner reality of a particular human subjectivity which would otherwise be incommunicable. I suppose this gets at what Orwell had in mind. But what, then, is the act of reading according to Orwell? Is it just the consumption of the subjective realities of others? A cheap ticket to self-transcendence? Maybe not so cheap: books can be costly and leisure time sparse, and we all need a sense of assurance that we’re not utterly alone in this life. And what is the act of writing? The assertion and exploration of the self, yes; but also a terrible devouring thirst to be known, a method of speculative astronomy that strives by means of guessed-at wormholes and gravitational vortices to bridge the gaps between distant suns.